Home / FILM POSTERS / Kevin Spacey becomes a cat in "Nine Lives"
Kevin Spacey becomes a cat in "Nine Lives"
From the director the worldwide blockbuster action comedy film “Men In Black,” filmmaker Barry Sonnenfeld brings together a cast of actors in his latest family movie “Nine Lives” led by Kevin Spacey with Jennifer Garner, Robbie Amell, Malina Weissman, Christopher Walken and Cheryl Hines. In “Nine Lives,” an immensely successful businessman who has built an empire at the expense of any sort of true human connection, Tom Brand (Spacey) is surrounded by good people who love him in spite of his skyscraper-sized flaws. But it isn’t until he finds himself with four paws and a tail that Tom realizes how lucky he’s been. 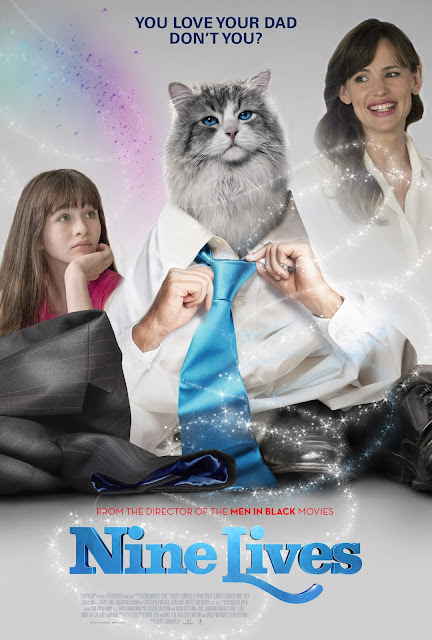 A unique mix of heartwarming family fare, supernatural mystery and slapstick comedy, “Nine Lives” also delivers the thrill of seeing one of the most talented actors of our time inhabiting the body of an adorable cat named Mr. Fuzzypants. Hearkening back to films as diverse as It’s a Wonderful Life, Big and Freaky Friday, it’s a concept that should appeal to audiences from 5 to 85 — and one that Kevin Spacey was excited to join. According to co-writer Ben Shiffren, the goal of the script was to tell a story with humor and heart about a man who has alienated his family by spending all his time at the office and is forced, through a magical intervention, to reassess his priorities. “We wanted the tone be a bit more mature than just a typical ‘cat hijinks’ movie, so parents are able to appreciate it as well as kids,” he adds.